And now, welcome to Fort Totten. I was under the impression that there was something historic here, in a park setting. Well, I didn’t find anything, and so I’ll explore later. So it was back to the train, to go on to our next stop. Returning to Fort Totten station, it appears at first glance like a typical elevated gull-wing station (the name “gull-wing” is the term for this kind of canopy design). However, while the Red Line platform is typical to the stations along that section of the line with above-ground platform and gull-wing canopy, the Green Line platform is unique in the system. It’s the only platform that is both outdoors and underground at the same time. The idea here is to join the gull-wing roof and the tunnel without passengers getting rained on. So, the gull-wing roof extends slightly into the tunnel, thus meeting this goal. In the underground portion, the architecture is a modified version of the six-coffer arch design, creating an unusual look for the station. The station really does become a tunnel in here, with the stone benches typical of underground stations replacing the windscreens seen on the outdoor portion of the platform. Also note the lack of pylons on this level. Out of the tunnel and into the station, this is the Greenbelt-bound side of the tracks. At the other end of the platform, the tracks go back into a tunnel again on their way to West Hyattsville. In the direction of Greenbelt, a train of CAF cars enters the station. From Fort Totten, we went south to U Street/African American Civil War Memorial/Cardozo, to visit the African American Civil War Memorial, a memorial commemorating African Americans who fought in the Civil War. Nearby, houses are painted in bright colors. Back underground at the U Street station, we wait for a Green Line train to take us down to Gallery Place-Chinatown. What’s wrong with this picture? Turns out that one of the color strips on the end of the sign is yellow! It should be green. And now, a CAF train arrives, to take us to Gallery Place-Chinatown station. An exchange of passengers at the Shaw-Howard University station. We leave the CAF train on the lower level of Gallery Place-Chinatown, and head up towards the surface. What’s going on? 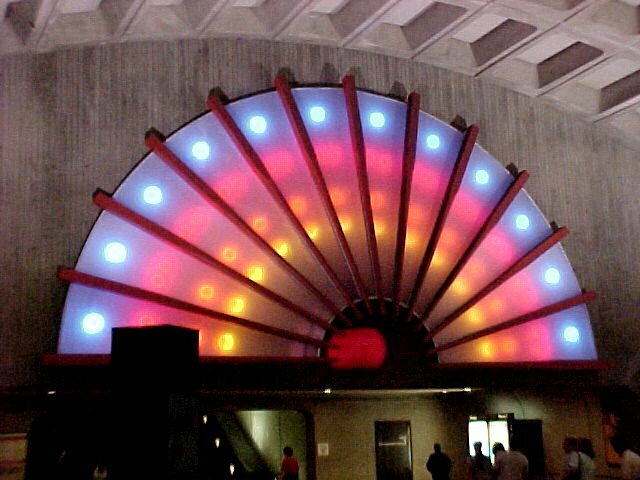 The Chinatown fan is not lit! According to the station manager, the sign was having electrical problems, and they were waiting for their contractor to arrive to fix it. Normally, this fan is lit up in all kinds of fun colors. A new building goes up! At the Da Hua Market, Sis models a bottle of Kikkoman soy sauce, getting special attention due to that parody Kikkoman advertisement found online. After seeing what we wanted to see, we crossed the street, and returned to the Gallery Place-Chinatown station. At Gallery Place, we caught up with a Yellow Line train, to go to Pentagon City Mall. One of the great features of the Yellow Line is going over the Potomac River vs. going under it like on the Blue/Orange line. On this movie, we are heading into Virginia as I film out the center door of the train. You can hear people talking on the train, as well as Breda train sounds. You can see the Pentagon itself as a low-lying building in the left of the frame about halfway through the video. Upon arriving at Pentagon City, we shopped. This is Pentagon City Mall. And now, returning to Pentagon City station, we start heading back to Vienna. This, however, is a Yellow Line train. We need Blue. Across the tracks, a Rohr train heads off to Franconia-Springfield. On the way to Rosslyn to transfer, we pass through Arlington Cemetery. Our last train of the day – Orange Line train to Vienna. At Vienna, the different color signs are kept right behind the operator’s seat. And finally, before going home, a peek between Breda 2050 and 2051, to see the “blind” ends of a pair of Breda cars. On the way home, Sis took a nice, long nap.